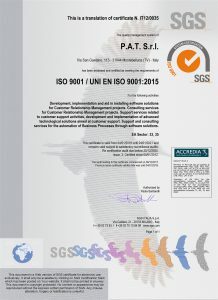 ISO 9001: 2015 Quality Management System Certification, demonstrate our company ability to responds in a consistent and comprehensive manner to customer expectations through the utilization of resources, procedures and instructions based on simplification, efficiency and effectiveness whilst being compliant to predefined requirements that measure the quality of business processes. Pat Group (Headquarter – Treviso Italy) has been accredited for the current year the ISO 9001 audit: 2015, adhering to organizational requirements. The audit certificates that Pat follows improvement processes that allow it to increase performance and proactively manage the non-compliance with procedures. This certification was awarded following the evaluation, analysis and observation of how the activities in the company are carried out and how specific organizational processes are designed to respond to an improvement process to deliver growth for the company. The annual renewal demonstrate that Pat leadership is committed to pursue a continuous improvement ensuring at all times the consisted processes outputs so to provide products and services that consistently meet or exceed the requirements ultimately providing an improved customers and users satisfaction.